BENGALURU: Hareesh Mothi, a financial professional, first came up with the concept of locking people up in a make-belief crime scene in April 2014. 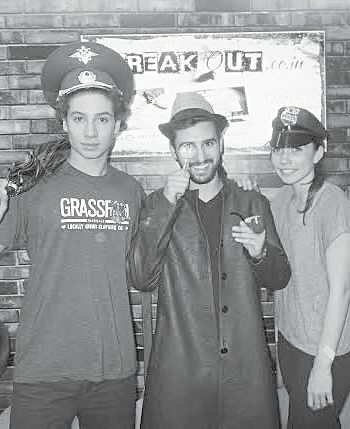 Breakout, a murder mystery game based in Koramangala is currently rated number 1 on Trip Advisor. Intel, HP and Ernst and Young are some of the companies that have conducted team building activities at the gaming center. The easiest game to crack is set in a 250 sq ft room with life-like props. You can see the outline of Shourik Sen, who was found mysteriously dead after his sister returned from a cricket match. Through the help of riddles, players have to figure out the motive, weapon and the culprit within 60 minutes after a thorough search – under the cupboard, through the broken cutlery – and observational skills -- the nature of the leaked gas. “The idea was always there after I played similar games abroad. I began experimenting with story-lines. By October and November concepts, after five and a half months,” says Hareesh. The game was set up through the help of a gaming expert in the US. This expert takes care of the story framework, intricate matters and gives Hareesh a final blueprint and takes care of the execution. “He is a magic man and I cannot reveal his identity as our agreement is not on paper. But I did at least 30 or 40 dry runs,” he says. Initially, the story line was about running away from the situation, but now the theme is saving the world. Currently, there are three games or three crime scenes. One is the rescue of a girl from her abductors. The most difficult scene is set in a mental asylum invaded by criminals, while the players have to act as MI6 agents decoding decryptions to figure out if inmates have died or escaped. “We are in the process of building more murder mysteries. Our USP is that it is a realistic concept,” he says. The purpose of the game is team building for corporates. The customers grew through word of mouth. Getting a slot on Saturday could be difficult. Hareesh has worked as an Audit Expert-Treasury, International Tax and Finance with HP. He also established his own company, Strategy and Consulting Group at Guru and Jana, Chartered Accountants. “Out of all these roles, training is my biggest passion,” he says. Forensic experts from India, travel across the world playing the real-life crime scenario games. In Poland, Harish was put in a room to detonate a bomb by finding some codes. “I was introduced to this in 2013, after that I wanted to do pioneer something on these lines in India. I enjoyed the game most in Czech, where I had to escape prison. In New York, I could not relate to the game as it was based on uncovering a random puppet in a theatre,” he says.